Reader Bonnie Brown is in luck. Reading a great post by my friend and colleague Amy Johnson Crow (here), she has a lead on connecting her line to a Revolutionary War patriot. One hitch: she needs to know the laws of descent at the time and in the place where a particular ancestor died. Yep, Bonnie is in luck. Because she’s researching in New Jersey. And because of the resources not only of The Legal Genealogist‘s alma mater, Rutgers Law School, but of the New Jersey State Library as well. First off, let’s review some terminology. The sources we need when we’re trying to find the law of a time and a place are either — or both — the compiled laws of the jurisdiction (here, the state government) and the session laws. Now you can imagine how hard it is to research the law when everything is arranged in purely chronological order. Finding this marriage law from 1776 and that marriage law from 1799 and that marriage law from 1801… bleah. And it wasn’t any easier for the lawyers or lawmakers. So, every so often, the legislatures would order the laws codified. Codification is the “process of collecting and arranging the laws of a country or state into a code, i.e., into a complete system of positive law, scientifically ordered, and promulgated by legislative authority.”4 The codification, then, called compiled laws or codes or revised laws or whatever term is used in the particular jurisdiction, puts all of the related laws on one topic in one place so they can be more easily consulted and understood. So… you can see why I said Bonnie is in luck. The statutes of New Jersey were compiled — codified — organized by topic — the very year that she needs to know what the law said. By looking at the list on the New Jersey State Library website, she can not only find Paterson’s 1800 compilation of the Laws of the State of New Jersey,7 but even a link to where she can find a digitized copy online, at Google Books. If she thinks perhaps her decedent may have died a little later, and wants to check and see what changes the legislature may have made in the year or two after that 1800 codification, she can either check the session laws year by year or take a look at the 1805 volume linked on the New Jersey State Library website setting out The Public Laws of the State of New Jersey … Since the Revision by Judge Paterson in 1800.8 Again, it’s digitized and readily available online. 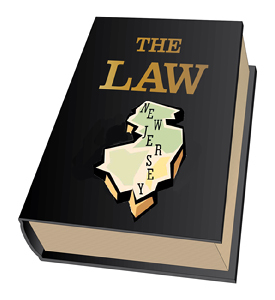 New Jersey research still requires us to do what The Legal Genealogist keeps insisting on: to understand the records, we have understand the law, and not the law in general, but the law at the specific time and in the specific place where the record was created. But the resources available in the Garden State make it easy. Bonnie is in luck in finding this answer. Hopefully she’ll have the same luck with linking to her patriot. New Jersey is much easier than colonial Georgia. Other than what is in the Colonial Georgia series I wonder if there is much left of the legislation from the colonial era.